We Drink Beer. Everyday: January 5: DuPont Avec Les Bons Voeux - our first Cross Country Drinking Video Session! 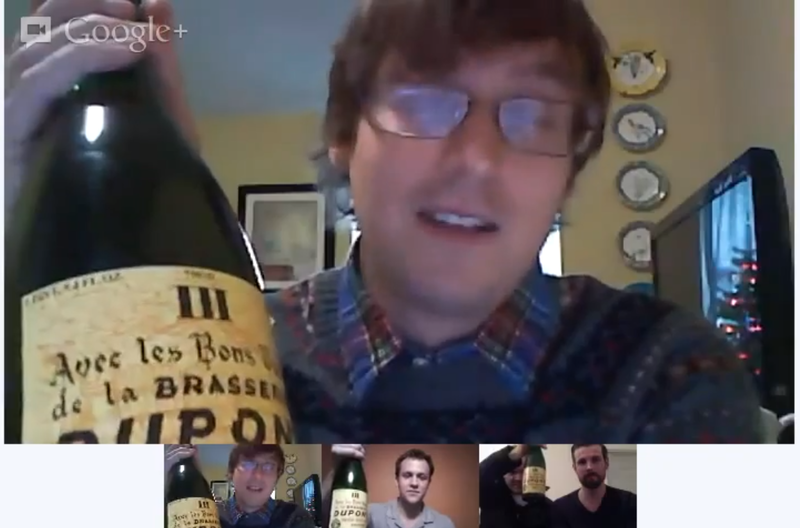 January 5: DuPont Avec Les Bons Voeux - our first Cross Country Drinking Video Session! This is our first gathering of what looks like to be the most exciting part about the blog (in my opinion at least). 4 people in 3 different timezones drink the same beer, at the same time and talk it out. Karl was the originator of this novel idea. We would like to do this more often, however, we believe that with the current state of beer distribution and the regional nature of craft brewing, it might be difficult for us all to have access to the same beer more than once a week (especially if it's a specialty beer like next week's The Bruery's Saison Rue). That being said, bringing 4 people together with very different beer backgrounds/experience to have live video blog is pretty special in my book. We'll be doing it once a week, so twice per style/theme. David is actually out on the East Coast this week, so he and I were able to meetup with Karl and Trevor on Google Hangouts to drink Dupont's Avec Les Bons Veoux, which Karl choose specifically because it was aptly named for the beginning of a new (beer) year. "Since 1970, the brewery has been brewing a special beer to give as a new years present to their best clients. 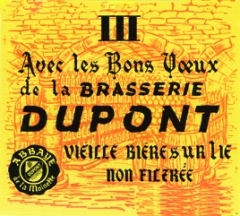 (the name of this beer “Avec les bons Vœux de la brasserie Dupont » means « With the best wishes of the brewery Dupont"
As this was our first video, it runs a little long - 23 minutes to be exact. In the future we'll strive to keep it down to an ingestible 5-10 minute run time. But don't hold me to that, we're passionate beer drinkers as well as a bunch of conversationalists (or blowhards, depending on your point of view).